It appears that mustard is having a moment this fall. I am fine with this because it's one of my favorite colors and it's also one of my favorite condiments! As you know, I'm really big on colors, but what you may not know is that I'm not a big fan of condiments. Truth be told, mustard is probably the only condiment I can stand. For example, I absolutely hate mayonnaise and I don't really like ketchup, but a little mustard on a sandwich or better yet a corn dog is just fine. Clearly, this skirt I have on today is a lovely mustard color. 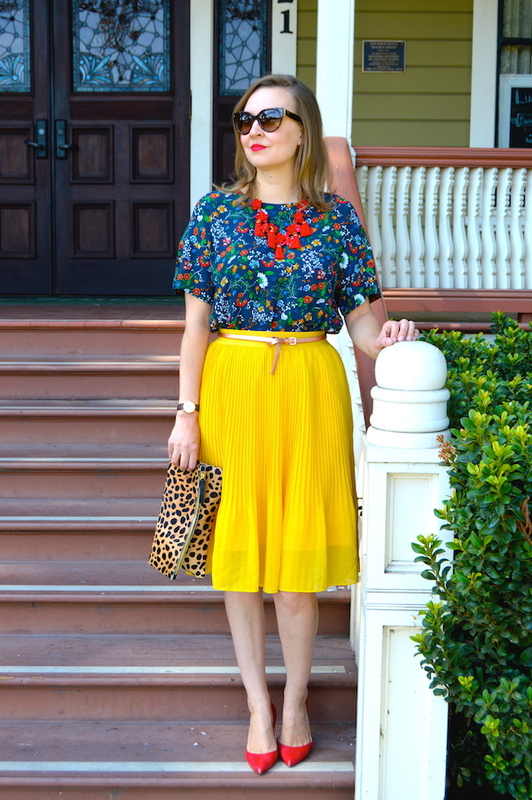 I would say that this particular skirt is more of yellow, French's mustard shade as opposed to a Dijon! Speaking of things that are having a moment, why is it that Target is so on point right now with their new lines of clothing? I think everyone likes shopping for fashion items at Target, but their new "A New Day" line is particularly awesome. 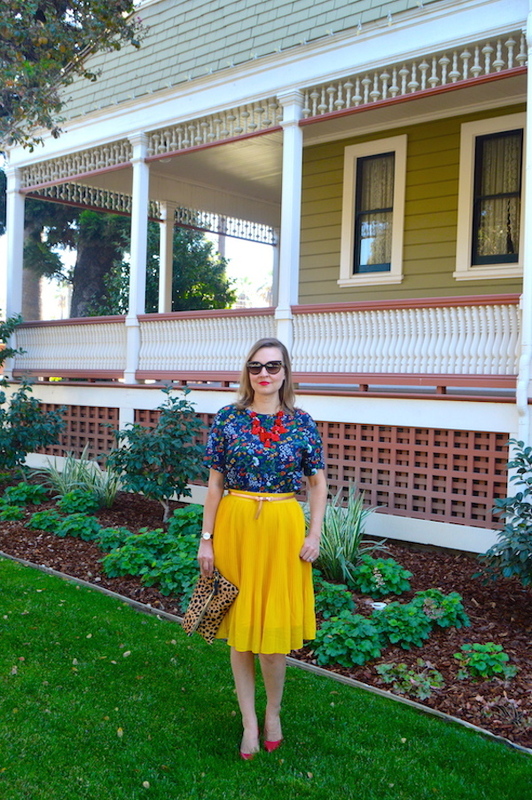 I have already purchased several items from the line, including this mustard skirt. I paired it here with a pretty floral top that was a steal for only $9.99 from H&M, another brand that's been really hitting it out of the park lately with affordable fall looks. So this look from head to toe, much like a bottle of mustard, is very affordable and very on trend for fall! What a pretty, colorful look! That outfit looks great on you! Kaite, you really do know how to create some fabulous color combinations! This is just gorgeous. I have been on somewhat of a shopping freeze so I have not even had a chance to check out Target's new lines. Maybe that's best for my bank account. Also, I am not a big fan of condiments either especially ketchup! It completely grosses me out! Thanks so much for sharing and for linking up with me On the Edge. I love all of the gorgeous colors in this outfit. 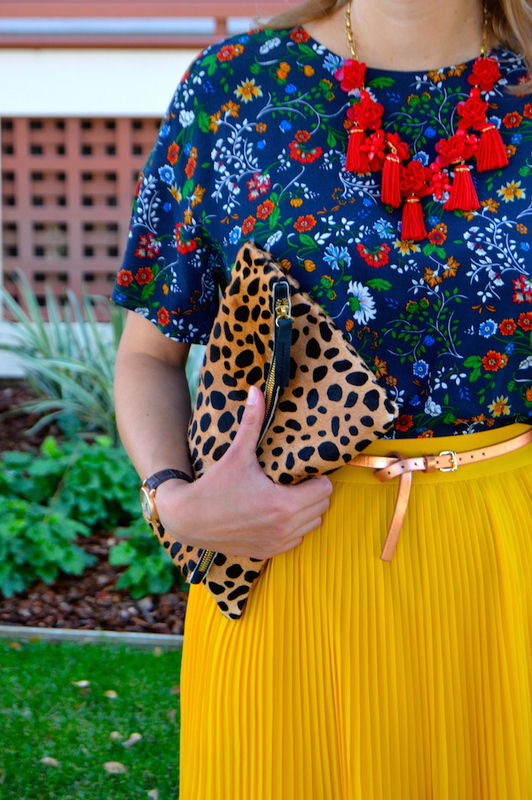 Pairing the mustard skirt with a blue, patterned shirt really brings out its vibrancy. This look is so cute for fall! I could definitely see myself wearing this.